ESA (The European Space Agency) and Arianespace announced today the signature of the launch services contract for the James Webb Space Telescope (JWST), to be orbited by an Ariane 5 ECA launch vehicle from the Guiana Space Center, Europe’s Spaceport in Kourou, French Guiana. The launch is planned for October 2018. The JWST is a joint project of NASA, ESA and the Canadian Space Agency. Europe’s contribution includes the Ariane 5 launch, along with two of the four state-of-the-art science instruments optimized for infrared observation of the Universe, and support for scientific operations. The mission will tackle a wide range of subjects, including detecting the first galaxies in the Universe and following their evolution over time, witnessing the birth of new stars and their planetary systems, and studying planets in our Solar System and around other stars. With its 6.5-meter-diameter telescope, the observatory will be folded up inside the fairing of the Ariane 5 ECA, the heavy-lift vehicle in Europe’s family of launchers. Following its separation from the launcher, in a direct transfer orbit to Lagrange Point 2 (1.5 million km from Earth on the anti-sunward side), the 6.5-ton observatory will shortly begin its deployment maneuvers as it heads to its operational orbit around L2. “It is a great honor for Arianespace to be entrusted with the launch of JWST, a major space observatory which will enable science to make a leap forward in its quest of understanding our Universe. It is also an immense privilege to be part of such an international endeavor gathering the best of United States, Europe and Canada space technology and industry”, said Stéphane Israël, Chairman & CEO of Arianespace. The Integrated Science Instrument Module, with all four flight instruments integrated, is currently undergoing final cryo-verification testing at NASA’s Goddard Space Flight Center. Integration of the 18 mirror segments, which will unfold after launch into the final configuration, is also now underway. 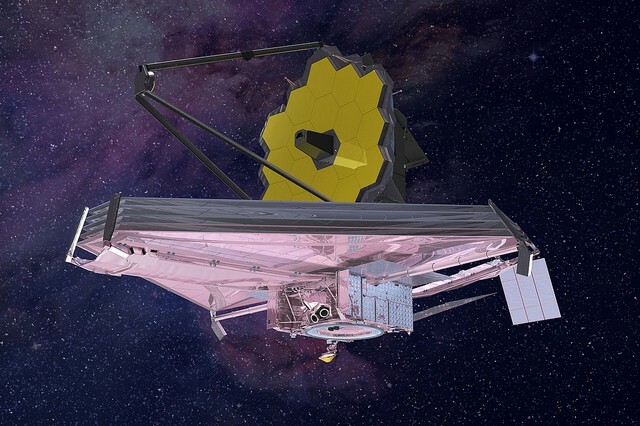 “With this agreement and NASA’s continuing solid progress in integrating and testing the JWST Observatory, we are maintaining a steady pace towards the launch in October 2018,” said Peter Jensen, ESA’s JWST Project Manager. Arianespace is the world’s leading satellite launch company. Founded in 1980, Arianespace deploys a family of three launchers, Ariane, Soyuz and Vega, to meet the needs of both commercial and government customers, and has performed over 270 launches to date. Backed by its 20 shareholders and the European Space Agency, Arianespace is the only company in the world capable of launching all types of payloads into all orbits, from the Guiana Space Center in French Guiana. As of December 17, 2015, Arianespace had carried out 227 Ariane launches, 38 Soyuz launches (12 at the Guiana Space Center and 26 from the Baikonur Cosmodrome, via Starsem) and six Vega launches. Arianespace is headquartered in Evry, near Paris, and has a facility at the Guiana Space Center, plus local offices in Washington D.C., Tokyo and Singapore.